Spring is a significant time in viticulture and winemaking. The buds burst from dormancy and our next vintage begins to take shape. The cool mornings and sunny days also seem to wake me from a winter slumber – I feel energised from the sun’s warmth. Being a sport tragic this time of year also signifies finals footy, the start of the cricket season and the spring carnival. In fact, the friendship between Brian and I – which eventually led to us establishing Izway Wines – was not only cemented by our passion for making wine, but by also our love of horses. Horse racing played a pivotal role in the establishment of Izway in both 2003 and again during a significant crossroads in 2005. When Brian and I started Izway we invested small amounts into the business when possible while also working full time. By the time we reached the harvest of 2005 we had spent all our money on fruit from the previous two seasons, but we still needed to bottle our first completed wine – the 2003 Bruce Shiraz. Finances were stretched, stress was high and things were looking rather dire. At this time my dad (one of the Three Brian’s) owned a race horse – Tails of Triomphe – which was about to contest its first major Group One race. This was a huge deal for our family, so we hired a limo, piled in and made our way to Morphettville for the South Australian Derby. The day was bleak and wet, but this brought smiles to our faces as we knew Tails loved a wet track. The more it rained, the more confident we became, and at some point, we decided to invest the last $70 in the Izway bank account into Tails of Triomphe’s triumph. We ought now to pause and highlight that, despite the rain, Tails was at this point still a 75/1 long shot and worth a fraction of the favourites in this prestigious horse race. The race itself was one of biblical proportions – Tails jumped from the gates terribly and settled last in the field. As the field stretched out our horse was much more tail than triumph – racing some 30 lengths from the leader. We took stock, realising at that moment the 2003 Bruce Shiraz – such a fantastic wine – may never see the bottle. 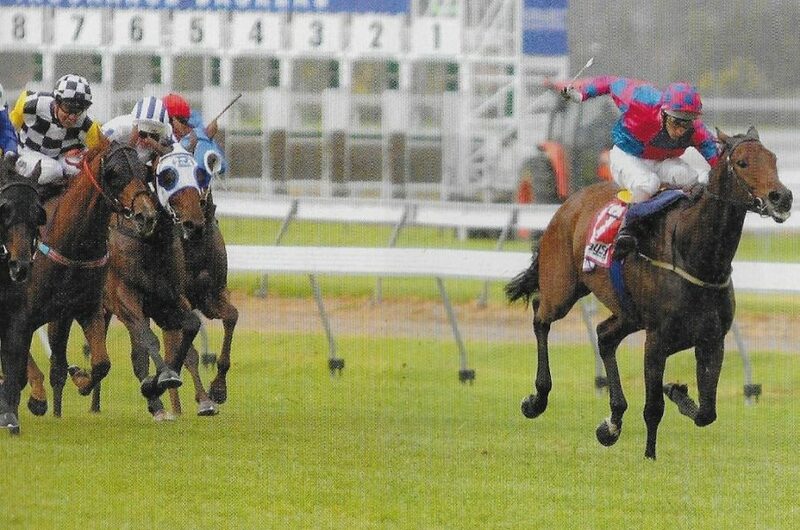 Coming into the last turn the field bunched and swung wide to find some firmer ground on the boggy marsh that was Morphettville on that May day of 2005. Our jockey Paul Gatt – now a veteran of the turf who performs best on a heavy track – rode for luck and cut through on the inside. Tails rounded up the field and shot to lead at the top of the straight. I am certain he knew the fate of Izway Wines was on his back as he ploughed through the Morphettville terroir, shooting two lengths clear to win in a canter. It was like a mosh pit in our section of the crowd. To be honest I don’t think I have ever been that excited in one moment in my life. We celebrated with Champagne well into the night and the 2003 Bruce Shiraz safely made its way to bottle.